So, Christmas is upon us and it should all do us good to take some time and think about the people who are not as fortunate as the rest of us. 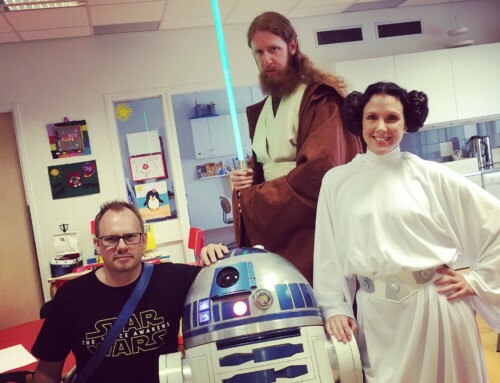 Last week, me, R2 and two friends visited Sweden’s first Child Hospice. For those not sure what a hospice is, it is basically a place where you go to be cared for at the end of your life. This was such a place… for children, who will never have the chance of growing up, never experience the joy of having kids of their own, never have time to realize their dreams. As soon as the question came if we wanted to come and help do something special for these kids, I immediately thought to myself that this is not something I can turn down. I made sure I did not have anything booked on the evening in question, and took a minute or two to really think, really make sure I had the strength in me to do this. I was happy that two of my friends, also Star Wars nerds like me, and proud members of the 501st and Rebel Legion, immediately agreed to come along. The week leading up to our visit was tough, to be frank. I found myself looking at my 6 month old and just hoping, wishing she would never have to go a place like the one I was going to visit. I started talking about what we were going to do with friends. Not because I wanted people to pat me on the back, saying how good it was of me to go, but because I needed to talk about it. I needed to process it. I knew I could cope with it, while being there, but I had a firm belief that I would break down and cry in the car home. If that was the case, so be it. I still had to go. 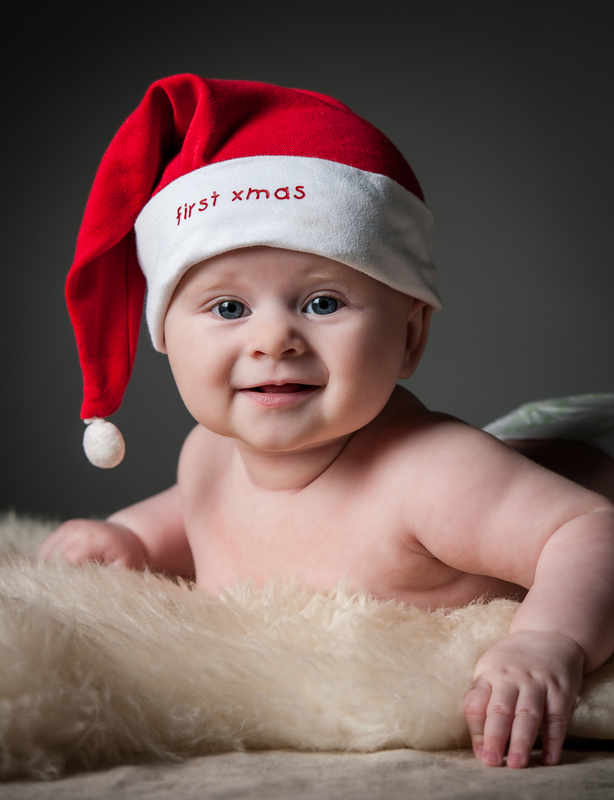 If only we could help bring some joy to the sick children and their families on this evening, right before their last christmas. Ever. Upon our arrival, we were told that two kids that were supposed to be there would not be there during the evening. Their condition had worsened. I was told that in their case, we were talking hours. What struck me as soon as we entered the room, with the Main Theme from Star Wars playing loudly from R2, was the positive feeling in the room. 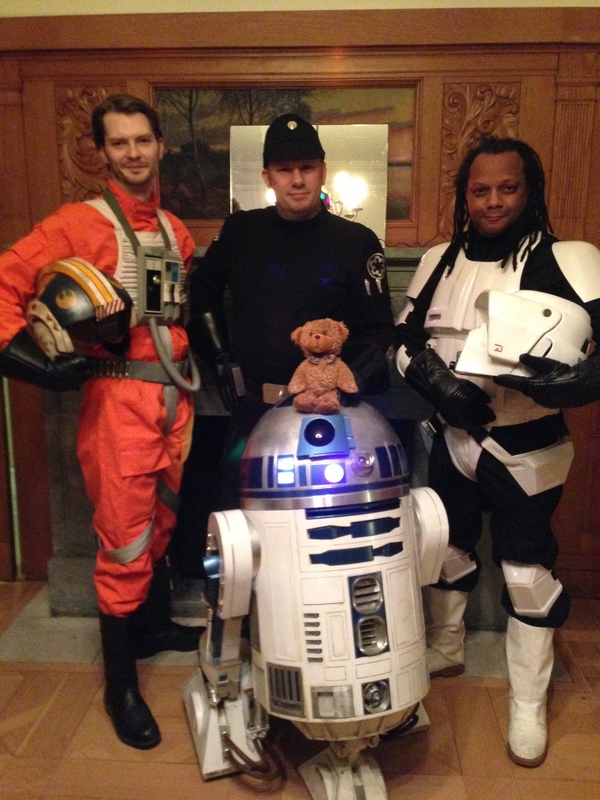 We showed off the droid and our costumes, and I had an option of saying a few words on who we were and why we are doing what we do for charity. After the christmas dinner, we all posed for pictures will all the kids and their families, and I was moved by how positive everyone felt and grateful towards us for being there. I didn’t break down in the car home. I actually felt quite good, knowing that the kids who stay at the hospice are well cared for and surrounded by people who love them. When I finally got home, I woke up Emma, who incidentally was turning 6 months that very same day, and just hugged hur for a while. Nothing else, just held her for a while and I was incredibly grateful on how healthy and great our daughter is. Somehow, my daily troubles seems a lot smaller and easier to deal with after this. By micke|2016-12-06T00:00:30+00:00December 19th, 2013|R2-D2|Comments Off on Heaviest charity job yet..